Two-year-old Harold Emanuel acts as a tiny tour guide as he leads a visitor through each of the Pence Place residents’ bedrooms, his hand gently knocking on each door before entering. Meanwhile, in the home’s large gathering area, his twin sister Savaeh is gently coaxed by a licensed practical nurse (LPN) to lift her head while laying on her stomach. 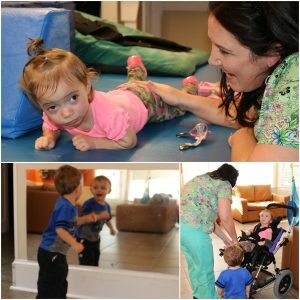 The brother-and-sister twins are the youngest residents of Pence Place, an intermediate care facility (ICF) and Monarch’s only children’s home specializing in the treatment of the most medically fragile young people with intellectual and developmental disabilities (I/DD) under the age of 18. Energetic and bright-eyed, Harold and Savaeh are thriving two-year-olds despite being diagnosed with adrenal insufficiency, cerebral palsy and I/DD. Doctors identified Harold’s diagnosis as a mild form while his sister was determined to be severe to profound. The twins’ grandmother, who acts as their guardian, visits weekly to check on their progress. Born in Scotland Memorial Hospital, their medical issues required a Life Flight to Duke University Hospital. They remained there until four months of age, at which time they were welcomed to Pence Place with open arms. They have grown to call Pence Place “home” as do seven other residents: Parker, Blake, Jessica, Timmy, Evan, Esther and Eric. The 27-member support staff ensures that there are enough hugs, story times and special trips to the zoo and the movies. Staff includes a registered nurse, licensed practical nurses and direct support professionals who care for Pence Place’s nine residents 24/7. “We have a great team. It is interesting to me to watch the bonds form. It is beautiful. The direct support professionals become their family,” said Beth Tyler, residential team leader at Pence Place and Mallard Lane Center, an ICF for adults located nearby. Tyler told of current, and even previous staff, who go above and beyond for the residents providing holiday treats, dinners and events throughout the year many times at their own expense or through donations. “They just do it on their own. They really are an awesome staff,” she said of their extraordinary ability as caregivers combined with their generosity and kindness. “The Pence Place residents naturally grow into their own family with the boys and girls developing a sibling closeness through their day-to-day interactions, too,” Tyler said. Licensed Practical Nurse Rebecca Monroe, who has been part of the Pence Place team since 2013, explained that work on motor skills with the residents is incorporated into natural, everyday activities. With the twins, Monroe is currently working with Savaeh toward being able to crawl and for Harold to increase the use of his right hand, which is affected by his diagnosis. Specifically designated for children, Pence Place staff must say good bye once residents turn 18. Tyler’s office wall is filled with many photos of children who have moved away during her six years working in the home. Pointing to each photo, she tells of their stories, recounting memories as if that of her own children. “I really do love it,” Tyler said of her role watching the Pence Place children grow even though there eventually comes a time for goodbye. Photo caption, top: Two-year-old Harold entertains his twin sister Savaeh with peek-a-boo while Licensed Practical Nurse Rebecca Monroe watches. Photo collage: At top, Savaeh works hard to lift her head with LPN Rebecca Monroe; bottom left, Harold reacts to seeing his reflection in the mirror; and bottom right, Harold watches as Monroe secures his sister into a specialized stroller to assist in moving her.